Operation: FAR STORM was a UNSC-Swords of Sanghelios joint operation to Installation 00. 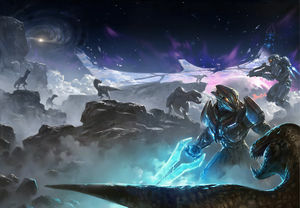 At the climax of the Human-Covenant War, the joint United Nations Space Command–Sangheili Fleet of Retribution and a Covenant fleet under the High Prophet of Truth's command traveled to Installation 00 through the slipspace portal at Voi, Kenya on Earth. The ensuing battle led to the dissolution of the Covenant Empire, the destruction of Installation 04's replacement, and heavy damage to Installation 00 itself. In 2555, renowned human scientist and historian Doctor Luther Mann discovered the location of Installation 07 by cross-referencing Forerunner architecture on the shield world of Trevelyan. The Office of Naval Intelligence subsequently sent a research detachment of approximately three hundred scientists of multiple fields, including Mann and Henry Lamb, to study Zeta Halo along with hundreds of automated probes to scan and map out the installation. While inspecting the ring's custodial systems, Mann and Lamb discovered a Forerunner timer that they concluded was counting down to the Halo Array's activation in five weeks. Following the discovery of a countdown on the Halo Array, both the UNSC and Swords of Sanghelios decided that the best course of action was to go to what remained of Installation 00 to try and manually stop the timer. 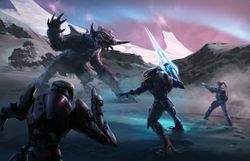 Members of the group came from both factions involved, including two Sangheili who had conducted operations on the installation; N'tho 'Sraom and Usze 'Taham, the former in command of the warship Mayhem. The mission was put into action rather abruptly - and earlier than planned - when the Huragok Drifts Randomly activated the Portal at Voi for the first time since the Battle of Earth in 2552. Almost immediately, a Retriever Sentinel emerged through the portal and began strip-mining the area around the portal, forcing the UNSC Endeavor and accompanying small craft to engage combat with it. After this event, the UNSC task force met aboard the Mayhem to discuss what to do next. The commander of the ship, N'tho 'Sraom, proceeded to kidnap the UNSC troops, believing that the more time wasted talking would mean less time to stop the activation of the Halo Array. Mayhem proceeded to enter the portal to travel to the Ark. A chaefka attacks the party on the Ark's surface. The Mayhem arrived at Installation 00 much earlier than expected; the previous voyage to the installation had taken weeks, whereas Mayhem arrived in a matter of mere hours. Upon exiting slipspace, the corvette was immediately engaged by more Retrievers, and was heavily damaged in the process, crash-landing on the surface of the installation. Unable to continue by air, the group set out to go to the Citadel by foot. The group, consisting of several UNSC Marines, two Spartan-IVs, several Sangheili and one Huragok, initially made slow progress over the blasted terrain, but eventually began to encounter some of the installation's ambient life in the form of Sky Leviathans. Shortly after, the group would be attacked by blind wolves and Chaefka, two predatory species 'native' to the installation. In the skirmish, Olympia Vale would injured and lured away from the battle by the monitor 000 Tragic Solitude, using a friendly Chaefka to lead her to the monitor. When Vale's absence was noted, Usze 'Taham, Elias Holt and Henry Lamb would be sent to track her down, while Captain Annabelle Richards would return to Mayhem after being injured, alongside her marines and those killed in the previous skirmish. Continuing on, the weather would become increasingly cold and arctic as temperatures dropped and snow began to form. Eventually, the first group - Kodiak, Luther Mann and N'tho 'Sraom, encountered a mammoth-like creature. The mammoth escorted the group across the now-frozen sea towards the island containing the citadel. Meanwhile, the second group would find the tracks of Vale and the chaefka, and used them to track for a time, before the snowfall becomes too heavy. Instead, they decide to continue on to the citadel, hoping to find an alternate route to the main party. They begin noticing an increase of temperature as they near the Ark's core and pass the ruins of High Charity, before eventually being set upon by armiger constructs. The group defends itself and destroys several as more continue to appear via slipspace portal. Vale, eventually arriving at her destination, would regain full control of herself as she encountered the installation monitor 000 Tragic Solitude, who would take on a form reminiscent of Vale, albeit golden. Here, Solitude would talk with Vale, and explain to her the purpose of the activation of the array and the portal; to rid the galaxy of 'destructive species' like Humanity and Sangheili and other alien species responsible for destroying Forerunner constructs, and then use the materials from their worlds to rebuild the Ark and repair it. Upon hearing this, Vale would attempt to reason with the monitor, but to no avail. On the outside, Usze, Holt and Lamb would encounter another new creature; some kind of carnivorous plant, which would proceed to attack the group and force them into a cave for shelter. They would manage to contact Kodiak, and request reinforcements, prompting the first group to rescue the second from the organism. The group, reunited, would then proceed to the Citadel, where Usze would remark upon how he had fought here in the Battle of Installation 00. The group would enter the construct and shut down the firing of the rings, before being set upon by a horde of armigers. At the same time, Solitude would explain that he only intended for Vale and Drifts to be kept alive, for reasons unknown. After escaping the ambush, the task force soon found itself in the bowels of the citadel. While trying to open a door, the group would be attacked by an Aggressor Sentinel, killing Henry Lamb in the process. The group would press on after the Huragok opened the door and pulled up a map, eventually beginning to hear voices in the distance. Tragic Solitude explained to Olympia how the activation of the rings had been halted, forcing the ancilla to put it's plan into motion early; unleashing hordes of retrievers upon Earth. On the other side of the galaxy, the UNSC Home Fleet would engage the invading force, initially repelling but soon being overhelmed by sheer numbers. As the group continued, they would soon discover Vale and Solitude, with Solitude ordering for Drifts to return control of the installation to him. When the request was refused, Solitude would unleash a human cyborg - the remains of Bobby Kodiak - to kill Vale. Vale would hold up in single combat, but the cyborg and retriever army would be recalled when Drifts Randomly would begin datamining the monitor. After being allowed into the chamber, Frank Kodiak would recognise his brother before the monitor once again tried to attack the group, this ending when Bobby destroyed the monitor's casing - killing himself in the process. As the Sangheili, humans, and Drifts set to work to repair the damaged Mayhem, UNSC Witness and a fleet of other UNSC ships arrived on the other side of the portal to investigate the source of the Retrievers' attack and retreat. Witness lifted Mayhem inside of it and all ships and personnel returned to Earth. UNSC research teams were deployed to the Ark through the portal afterward, with hope that the UNSC would now use the deactivated Retrievers to finish 000 Tragic Solitude's work and repair the Ark. The communication skills and combat prowess displayed by Vale throughout Operation: FAR STORM did not go unnoticed by the upper echelons of ONI. After the mission, perhaps at Spartan Frank Kodiak's suggestion, Vale considered joining the SPARTAN-IV program. After her experience at Installation 00, Vale found difficulty in returning to her former, often bureaucratic, routine. Seeking new challenges, she entered the UNSC's inter-service War Games and managed to place in the top five percent. As a result of her performance, as well as recommendations from the highest levels of the Office of Naval Intelligence, Vale was eventually recruited to become a Spartan-IV.